Tetlow King Planning (TKP) advised Frome Town Council on the drafting of its Neighbourhood Plan. Neighbourhood Plans form a cornerstone of the Localism Act 2011 and current Government planning policy. Frome Town Council made a successful bid to be one of the DCLG’s funded Neighbourhood Plan frontrunners. The Town Council moved forward to establish the foundations of a plan which reflects the wishes of the local community. 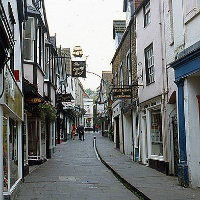 At the time Frome benefited from having a community strategic plan (Vision for Frome), Mendip District Council’s draft Core Strategy, the Town Council Strategic Plan and a draft Design Statement for Frome. These documents were used by the Neighbourhood Plan Steering Group to compile a list of identified priorities. These priorities were then tested using a Citizens’ Panel, a small representative group of people, to ensure that the identified priorities are still relevant. Set down the key components of development and land use that the Neighbourhood Plan will support and the criteria that will be used to decide whether a development proposal is likely to be acceptable or not. © Image copyright Ronald Searle and licensed for reuse under this Creative Commons Licence.